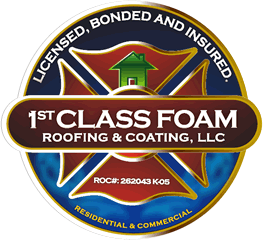 1st Class Foam Roofing and Coating is here to help! The sunny climate in Scottsdale is one reason it's such a popular place for people to visit and live. However, those tropical temperatures can be hard on your property and particularly your roof. High temperatures and UV exposure can break down your roofing materials over time, and the high winds and heavy rains that come with Arizona's monsoon season can tear off roofing materials. Foam roofing is a popular choice in Scottsdale because it stands up to the rains and the UV exposure. You don't have to worry about materials being torn off like you do with shingle or tile, and the foam provides superior protection against water damage. You need to hire a foam roofing contractor who has the skills and experience to expertly install and repair these roofs to get the best results. The experts at First Class Foam Roofing and Coating perform everything from new foam roof installations to repairs of spray foam roofs. We have a reputation for providing superior service and quality in Scottsdale. We are a full-service Scottsdale foam roofing company for both residential and commercial clients. Whether you have a foam roof already or you are interested in getting one, we can help you. You can't trust just any foam roofing contractor you find online. You need to find a contractor that has the experience and skills to perform the job well. First Class Foam Roofing and Coating has earned a reputation as the best in Scottsdale. We hire only roofing contractors who are highly skilled and experienced in the care and installation of spray foam roofs. When you hire us, you can trust that you are getting a dedicated contractor who will give you a great roof that will protect your property for years to come. Working with the most skilled roofers won't mean much to you if they are rude, negligent or hard to reach. At First Class Roofing and Coating, we pride ourselves on our commitment to service. We are dedicated to our customers, and we go above and beyond in trying to meet their needs. Whether you are calling to ask a question or you are talking through your roofing options with your foam roofing contractor, you will get honest and thoughtful answers in a friendly manner. We aim to build life-long relationships with our customers, and we bring that dedication to every interaction. You need only ask our other customers or read our online reviews to find out what kind of service we are known to offer. Call us today to schedule a free estimate for spray foam roofing services in Scottsdale.